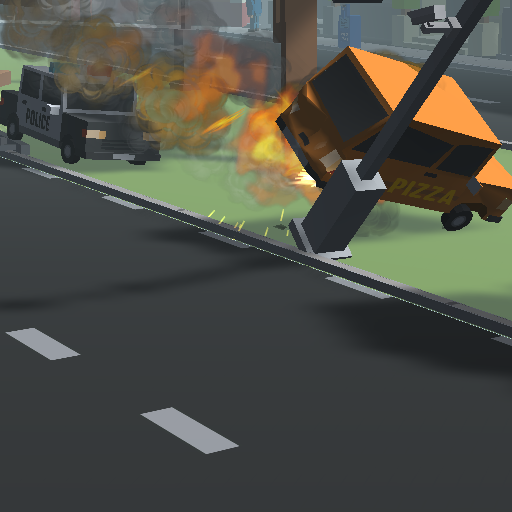 Crash World is a totally realistic racing game, where the cops are really smart. 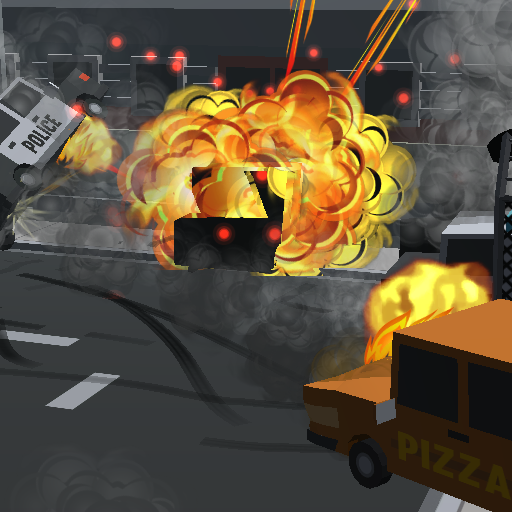 We're building real simulations here. And (not really dead) people! This looks fantastic. Though I'd say you might want to increase the speed ramp - it seems to start out a bit slow. Anyway have a little demo of the traffic AI. What's the joy in driving a tank without shooting? So I made it shoot! The targeting wasn't as easy as I thought as you have to move 2 turret components separately; the turret body and the barrel. Some space transformations going on here that made the whole thing mush easier - get the target in the tanks local space. Then calculate 2 angles, the Y angle of the turret using the standard Atan2 and the X angle of the barrel using Asin. Also a bit of magic when picking targets - pick the targets visible on the screen, otherwise the tank would constantly target stuff behind me that's offscreen. You can see the results here. Hahaha! Love this idea and the screen shots on the website and devlog. Hilarious. Out of curiosity - was the music in that video placeholder, or is that something you've created/found? It's fitting, but it seemed like the loop was very short (I think it played twice in :45?). Thanks, I'm having a lot of fun capturing those silly screenshots and I hope the players will fill that role one day. There was a royalty free music bundle a while back (kinda like Humble Bundle, but for music) with a couple of rock tunes, so I used those. Total of 3 tracks each being 2-3 minutes long. Turns out music is a big contributor to installation size, so I'm keeping the total size low, but my plan is to use downloadable content later on so that won't be an issue. 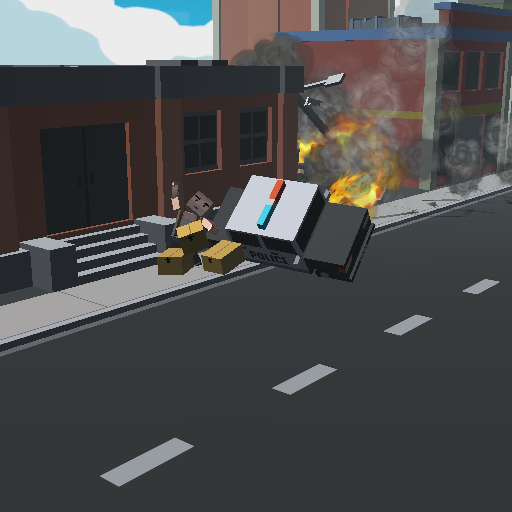 Started adding cops to our infinite mode. Still a lot of tweaking, but I managed to grab some awesome camera footage! Also, we've done a private demo! Still lacks a lot of features, but we're showing it to people who're interested in the game. So if you want to see what we've got send me a PM! Seems fun, I post to follow. So my last month or so was focused on adding some eyecandy to the game. So it's been 6 months since I started, and I'm aiming to finish this up and release. After all, you should release "early and often". Tell me how you like the game and would you play it? For each movable object I replace that object with a placeholder that spawns the real object when the player gets near, and despawns it when the player is far away. I couldn't pool all the movable objects because it's hard to return some into their initial state after being in the game world. These are pedestrians with ragdolls, breakable objects, props, etc. I did implement pooling on what's left of the modules after filtering movable objects, and also I pooled the particle effects. I'm still in the process of doing this, and I'm atlasing textures and meshes into as little materials as possible. This is just step one for the following phase: static batching. I indend to (as a part of the post process mentioned above) merge meshes that share the same material into a single mesh, bringing down my batch count considerable in theory. That said, I'm going to start giving out new demo's as soon as I have the feature complete gameplay. To get notified, either reply here or message me!